Diamond Color Explained - How to Get the Biggest Bang for Your Buck! Diamond Color Explained – How to Get the Biggest Bang for Your Buck! Society has painted the quintessential diamond before our eyes. And the classic gem, if not icy-white, has no color. It is luminescent, transparent, and the non-pigment we perceive is actually the dance of light that makes diamonds so mesmerizing! So, what do we mean by Diamond Color if the perfect diamond should have no color? Nope, we’re not talking about fancy colored diamonds with evident flushes of the shades of the rainbow. They belong to a whole other spectrum. The thing is, white diamonds aren’t all faultlessly white. In fact, most diamonds are born with a hint of yellow or brown. These shades go from color D to Z! 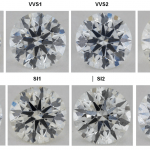 In this post, we’re delving into these different color grades; how each category impacts the diamond’s sparkle, and which one will give you an icy-white diamond without going for the most expensive grade. 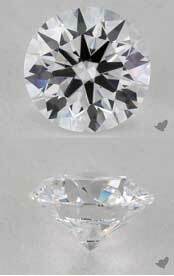 As one of the steerers of the Diamond 4Cs, color affects the diamond’s overall appearance. When light reflects into the diamond’s prismatic facets, it bounces to a range of hues we call “fire.” And if there’s noticeable color in a diamond, it won’t be able to reflect light as much as a colorless diamond can. Ultimately, lower color grades will exhibit lesser transparency and scintillation compared to diamonds with no discernible color at all. Thus, the more colorless a diamond is, the better its light absorption and visible sparkle. For this reason, people usually go for colorless diamonds. But this doesn’t make diamonds with warmer colors less desirable. Color grades range from D (colorless) to Z (yellow/light brown). Gemologists grade diamonds facing down on a white surface and controlled lighting as it’s hard to evaluate color when diamonds are viewed face up. 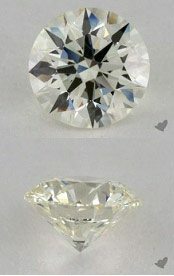 Unlike the diamond cut where you should always opt for the best, the color of a diamond is a great place to save money! Diamonds within the colorless range are the rarest ones. D and E-colored diamonds will display virtually no color. They are icy white! F colored diamonds, on the other hand, display a nearly undetected amount of color, but only when viewed face down by a gemologist. Even I have never been able to distinguish a D and an F-colored diamond when they are not directly next to each other in the face-down position. Diamonds in this category are best mounted in platinum or white gold since yellow gold and other colored settings will take away from the high luminosity of the color grades. Diamonds within the near colorless range appear colorless in the face-up position. However, when viewed face down, they exhibit a slight amount of body color. In order to see it, the diamond has to be viewed against a perfectly white background. But once the diamond is mounted on a ring setting, the color will not be detectable by a layman. Therefore, near colorless diamonds are the best option for getting the biggest bang for your buck! K to M graded diamonds show a slight hint of color in the face-up position. They resonate with people who like the warmer look of faint color diamonds. This is a sure win for those who want to set their diamond in a yellow gold ring setting. And since diamonds pick up quite a lot of color from a yellow gold ring setting, it would not be wise to overspend on color. Now, I wouldn’t recommend color grades N-R (Very Light Tint) and S-Z (Light Tint) due to strong yellow or brown tinting. Unless, of course, you prefer these deeper shades. As mentioned earlier, most diamonds are bought to be mounted on a ring setting, and a diamond attached to the ring will invariably pick up some of the metal’s color! Diamonds in yellow gold settings adapt more of the yellow gold hue compared to diamonds set in a white gold. For this reason, diamonds in yellow gold don’t have to have such a good color grade as you would choose for a diamond in a white gold ring. Just have a look at these diamonds on yellow gold ring settings and these diamonds on white gold ring settings. It is quite apparent that diamonds in yellow gold ring settings absorb much more of the ring color. You can take advantage of this knowledge and save yourself some money! Furthermore, the diamond shape will have an impact on the diamond color as the proportions and faceting patterns of various diamond shapes differ. For this reason, certain shapes are more prone to showing off their body color. The round cut is the shape that’s least prone to showing off body color. Princess, emerald, and asscher cut diamonds are more likely to display some. So, it is advisable to choose one grade higher than what you would choose for a round cut diamond. 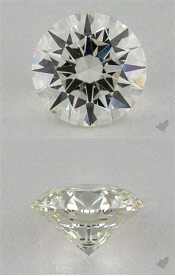 All the other diamond shapes especially the elongated ones like oval, marquise, and pear cut diamonds are even more prone to body color. In these shapes, color can be easily seen near the pointed tips. Thus, you would have to choose an even better grade! I guarantee that if you use the color grades above, untrained eyes will think that you bought a diamond with the highest color grade! You should also take note of color’s effect on big diamonds. Larger diamonds trap more body color compared to smaller diamonds. If you take a 0.5-carat diamond and a 3-carat diamond with the same color and directly compared them to each other, you’ll see that the smaller diamond is more colorless. Also, if you buy an even larger diamond (from 2-carat upwards), you might consider getting a color grade better than you would normally have chosen – according to my “best bang for your buck color grade table” above. Another interesting fact is that some diamonds exhibit fluorescence. No matter what degree, it's always noted in the grading report. If you don’t have much money to spend and want to buy a diamond in the I-K color range, you might consider buying a diamond with medium or strong blue fluorescence since they are usually sold at a discounted price. Though please be aware that I do not recommend buying diamonds with fluorescence apart from diamonds in this particular color range. You can find more information about how it could help you boost a diamond within the I-K color range in my post about diamond fluorescence. The best thing about choosing a diamond color with the table above is that you are not “wasting” money on a premium feature that you wouldn’t be able to appreciate with your bare eyes. Of course, I am well aware that many people want to get the best diamond color because this is supposedly a matter of honor. And this is absolutely fine. I just want to let you know that you can maximize your budget if you want to. Now, all the other 3Cs being equal, you can clearly see that the D color is priced at a large premium because it is rare. Though a diamond with an H color set in a ring setting will appear completely colorless, too. And will save you a lot of money! 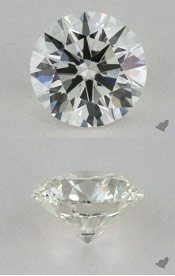 Which Diamond Color Grade Should You Choose? The most popular color grade is G, but this doesn't mean that you can only choose this grade to get the biggest bang for your buck. What's more vital is never to choose a color grade better than G! The reason is quite simply that as a typical customer, you would most likely not see a difference between a G and a D color if they were held next to each other. You would end up paying way more for an invisible feature, apart from the color grade you will see on your diamond certificate. Now, I guess that you can see a difference between both diamonds in terms of color. But you have to consider that you can only see it because both diamonds are shown in 10x magnification, and are directly compared. Furthermore, you are comparing loose diamonds to each other! Without this comparison, the G-colored diamond would appear to be completely colorless. Even diamond grading experts from GIA and AGS who are grading diamonds all day long can only estimate the color by comparing the diamond to a set of master diamonds. This is done under the best lighting conditions. I know from experience that many people would consider an I or even a J-colored diamond as colorless if they weren’t able to inspect it next to a D-colored diamond! The best color grade will largely depend on what kind of diamond and ring metal you intend to use. I want you to get the biggest bang for your buck which means you get a diamond that looks completely colorless, but in reality, does not have a D color grade. And you’ll find this from G and below! But then again, color is subjective, and you have the final say in this. Whether you’re a diamond purist who's ever-enamored with the gem’s translucence, or you belong to cultures that see warmer tones as more amusing, you’ll have a wide selection of shades to choose from. Diamond Query: Getting the Best Bang for the Buck with Cut, Color, and Setting in a 1.3-Carat Round Diamond Which Diamond Color offers the Best Value? What’s the Best Diamond Color for Yellow Gold Rings? 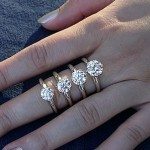 What is the Best Diamond Color for Platinum Rings? Hello, I am looking for a 2.5 round. 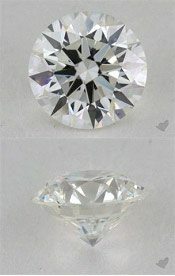 I’m learning about the importance of a diamond’s cut, I’m looking for a GIA excellent, but how do I know about excellent proportions beyond that? Thank you for your inquiry. I am happy to help. 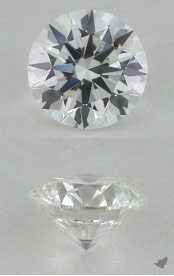 Please see attached link from my website that provides the suggested range for proportions for a round diamond in order to get the maximum sparkle. I purchased this stone yesterday after literally looking at it and many others for months. I felt the price was on point, and the body color was less than so many other J colored stones I considered. I know that through the the table the color is less obvious than viewing through the sides. I wonder what your perceptions are, and when deciding how to mount it should i consider a bezel to minimize the body color, I do not wear yellow gold so I will be putting it in either white gold or platinum. Would a halo with like colored stones minimize the body color? I appreciate your expertise! Congratulations, that’s a wonderful emerald cut! Have you thought about rose gold settings? The bezel will only help if it’s in rose gold as white gold or platinum will more likely highlight the diamond color. You may also opt for a halo setting with K-colored diamonds to make the J color seem whiter than it is. Set in a plain solitary yellow gold setting with gold prongs. Thanks, glad you enjoyed it! This diamond has a slightly larger table, but it’s eye clean and doesn’t have a bow-tie effect. If the warm color and sparkle looks good to you, that’s what really matters. Check out this post to know more about the oval cut. I don’t see a grading certificate for the more expensive diamond. If it really doesn’t have one, then the second diamond is a better deal. It has the right proportions, plus it’s more affordable. And a J and K color will look the same to the naked eye. This is so helpful! However I have slightly different question, I’m looking for a yellow diamond but in the GIA report the diamond I’m interested has a colour grading of W-X. Does that mean it’s a very “yellow” white diamond? Sorry I’m not very educated in this! A W-X colored diamond still falls within the color scale of a natural colorless diamond. Starting from the X- Y– Z range, we call them “Cape diamonds”. They contain noticeable hints of yellow or brown. And it’s also the beginning of the fancy color diamond scale. So, your diamond could be a colorless diamond with noticeable traces of yellow or brown. 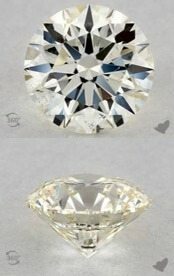 Im looking at buying an oval 1.12 carat, SI1, J. This will be set on a white gold band with a few 0.32 round brilliant cut diamonds on it. 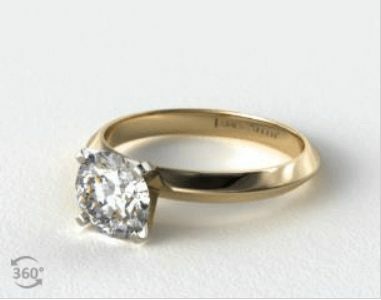 My question is, i) will the J oval Stone appear yellowish against the Band with the 0.32 carat stones? 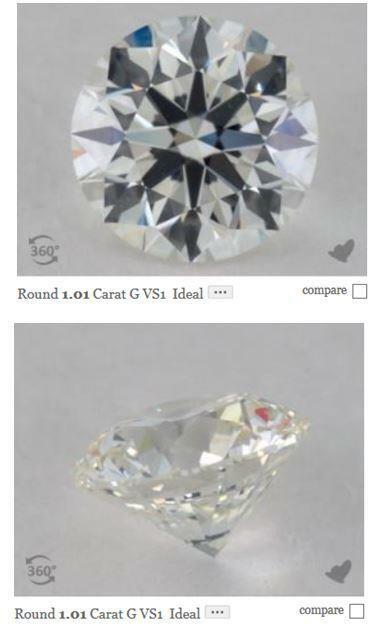 ii) if I were to put a halo of the 0.32 round brilliants around the oval J diamond, would the contrast in colors between the big stone and smaller halo be noticeable, such that it detracts from the bigger diamond? 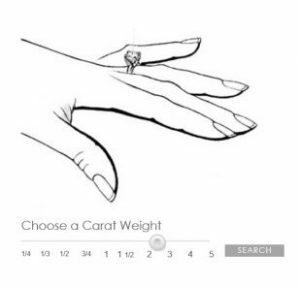 Yes, the warmth of a 1-carat J-colored oval cut diamond will be noticeable amidst the diamonds on a pave band or halo setting – that’s if the 0.32 ct. diamonds have a higher color grade than the main stone. If the side diamonds are also J-colored or even lower, the oval diamond will just blend in. But if you want to make the main stone appear whiter, I suggest you opt for a G or H color. Or opt for a rose/yellow gold ring with J or K-colored side stones. Hello Sebastian, thank you so much for all the useful information! 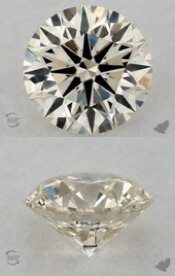 I’m looking to get a bigger stone (2.5-3ct), my jeweller suggested this 3.03 J VS2 to me and claimed that it is a top J and doesn’t look yellow most of the time. I want to set it with 18k white gold. Do you think it is a good stone? Thanks for the feedback! Regarding your question, I wouldn’t recommend a J color for a big stone like 3 carats as the color will be evident especially amidst a white gold setting. The diamond cut is excellent, but you might want to see magnified photos of the diamond beside the setting or see it in person to really know if J color looks good enough to you, and to also see if it’s eye clean. Have I made a good choice? Hi Lewis, the diamond is within super ideal cut proportions. It’s beautiful, good job! I am about to purchase a GIA certified 2.01 carat D color diamond, triple excellent cut on a k1/2 size finger. It is an extremely sparkly diamond and has no fluorescence. The girdle is medium to slightly thick. Quality wise, I would say it looks perfect. I am unsure whether I should sacrifice the color for a bigger diamond (sticking to the same price). The quality of the diamond is amazing and eye clean, however wonder whether I could maintain that sparkle and quality with a lesser color grade and bigger diamond. Also, would it be worth sacrificing the color for a bigger diamond? The sparkle of a diamond lies in the cut. As long it’s within the standard round cut or super ideal cut proportions, it will display superb brilliance, fire, and scintillation. You can probably go lower to up to F color as the difference in the D-F range is barely noticeable. If you’re going to go higher in carat size, just make sure it’s still eye clean and has the best cut possible. What’s the best way to maximize the face up appearance of a diamond? The best sparkle is achieved with an excellent or ideal cut while the icy-white color is seen in the D-F range. Although if you’re on a budget, G color is a great alternative. For clarity, you can go as low as VS2 as long as the diamond is eye clean (without visible flaws/inclusions). Hope that helps! Go for a G color if it has none to faint fluorescence because if it has medium to strong you wouldn’t really benefit from G’s near colorless tint. It’s best to opt for an H or I with medium to strong fluorescence so the blue and yellow can complement each other and make your diamond appear whiter than it is. Good luck! I am looking at buying a round cut 2.5carat diamond , set in platinum with a GIA certificate – colour N, it is triple excellent, SL1. They are looking at a price of £8200 – is this a reasonable price? Also worried about it being an N colour! Hi Nicola, can you provide the diamond cut proportions so I can give you a detailed feedback? Also, the yellow tint in an N color diamond is pretty evident, so if you prefer an icy-white diamond, I would recommend a G color and beyond. I’m between two round cuts, a 1.6 I VS1 (7.5mm) ideal which has a HCA of 1 or a 1.5 H VS2 (7.3mm) ideal and HCA of 2.5. 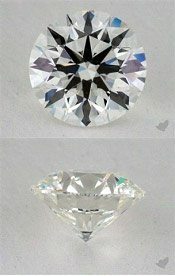 I’m looking for the most diamond for my money and believe I can sacrifice color if the cut excellent. What do you think? Hi Jeff, can you provide the diamond cut proportions of the two diamonds so I can give you a detailed feedback? Thanks! I feel like this is a pretty strong diamond for the price. Went lower end on color/clarity but the rest seems pretty good. Wanted to get your opinion on a couple of things: (1) proportions don’t necessarily seem the best but it is still rated as excellent by GIA (2) Does the “strong blue florescence” make it a no go for you or is that ok? forgot to leave the link! Hi Jordan, the strong blue fluorescence is counterbalanced by J color’s yellow tint, so it doesn’t appear as warm and hazy as it should be – which is a good thing. And yes, the proportions aren’t ideal but the diamond looks good! Although if you’re after super ideal cut proportions for maximum brilliance, I suggest you keep searching. First and foremost, let me say you’ve got one of the most helpful websites I’ve come across yet – thank you for that! So I’m in the process of purchasing an engagement ring and have a quick question which I’m hoping you can help with… After meeting with the jeweler yesterday, I decided on purchasing a GIA certified 1.25 carat Princess Cut, VS2, color I.
I just did some quick searching online and found a GIA certified 1.2 carat, Princess Cut, VS2, color F, but it’s about $500 more. In your opinion, is the difference from I to F truly that noticeable to the human eye, and if so, is it worth spending the $500 more? Thanks for your feedback! The price could go up as the I color is more evident in a 1 carat princess cut since bigger size and fancy shapes tend to expose more body color. Although you can always set it in a rose or yellow gold setting to make it appear whiter than it is. But the most important factor in pricing is the cut proportions. Since it’s the ruler of the 4Cs, it determines the overall performance of the diamond. Check out my suggested proportions for princess cuts here, and if your diamond is within the indicated dimensions, then it’s probably worth the price. If only that diamond’s girdle is thin-medium and crown angle is .5 less, it would be super ideal. It’s still an excellent cut though. It’s also backed by GIA and priced just right. Although, make sure it’s really eye clean by viewing it from all angles under a loupe. A 360-degree video will also do. Hi! I’m looking for a really large diamond… Around the 3 carat range. I definitely want a round brilliant. Would you recommend a L color if I’m setting it in yellow gold? Or K, just to be safe? What about having a pave band…. would you recommend those diamonds to be the same color grade as the main one, so that the difference between small G’s and one large L isn’t crazy looking. I would recommend a J or K color because a big diamond like 3 carats will definitely adapt more body color. And if you’re going to pair it with a pave setting, make sure the diamonds are not brighter than the main diamond. See if a similar color will do or try opting for a shade darker to be safe. Test everything out and see for yourself, goodluck! Also – most yellow gold settings I see have white gold prongs…does that still work for your color chart? Or do the prongs need to be yellow gold, too? Since we’re talking about the J-K diamond color range, the prongs should be yellow gold as well. we’re a bit stumped so i need advice. 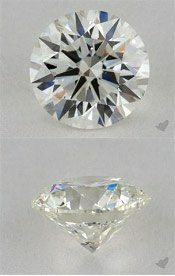 Which of the two is a better choice: 1.11 H IF or a 1.02 D VS2 round diamond. Both are triple excellent and the fluorescence is medium for the H and Faint for the D color diamond. I plan on setting it in a platinum setting. The price difference isn’t too drastic, i just don’t know if color is something i should sacrifice for clarity and carat size. 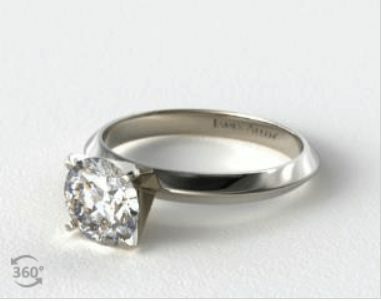 Clarity grades beyond VS2 are considered overkill and the difference between 1.11ct and 1.02ct are barely noticeable. That said, I would choose the one with the D color as it will noticeably look more icy-white than the H color especially when paired with a platinum setting. Great site with a lot of good information. I am looking at a 1.8 carrot round excellent cut VS1 G diamond that will be set on a 18k yellow gold ring. Based on everything I’ve read online (including your site) I feel I may be getting too high of a color diamond. Do you think I am placing too much importance on the color and should increase the size instead? Thanks for your feedback! G color is just right for a round 1.8 carats. If you’d like to see an icier white diamond, you can always upgrade the color. It’s really up to you. But G will do just fine. Thanks for your informative website. I was ring shopping today and almost pulled the trigger on a round K-cut 2.01 carat diamond for about $9,000. The jeweler said he would set it in a setting with a halo with other matching diamonds so the color wouldn’t be an issue. I am going with a platinum band. What do you think ? thanks ! If you’re opting for a platinum band with a diamond of 2 or more carats, I would recommend a G color. Make sure it is eye clean (or no flaws are visible). And before anything else, consider the best cut possible (excellent/ideal cut). Goodluck! Thanks for your wonderful feedback! Color and clarity are subjective. Most buyers would opt for the highest grades due of supply and demand. 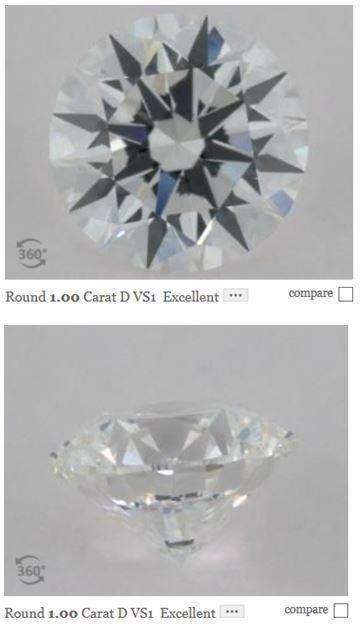 But in reality, the differences between D-G color or VVS1-VS2 for a 0.50ct diamond is hardly noticeable. I would like to say that your website is one of the best websites that contain practical information about choosing diamonds. From the table above, you have indicated that depending on the cut and setting color, it is possible to optimise the white diamond color that will give the best value. I would like to ask if the color setting is rose gold, would it be possible for you to provide an optimised diamond color to get the best price value. I hope you can help with this as I am trying to get a rose gold ring with white diamond for engagement. Thanks heaps. Thanks for your feedback. 🙂 To answer your question, yes, it’s definitely possible. I would recommend any color grade from J-M for round cuts and I-J for other shapes. Please refer to this article to know more about the best diamond color for rose gold settings. Cheers! Thanks Sebastian. I have been reading your site yesterday and it really contains so many valuable information about diamonds. And I am very impressed with your knowledge about diamonds and your optimization methods for getting a diamond for a ring. I’m considering a 2.5 round cut I Color SI2. It is ideal cut, polish and symmetry. Graded by AGS. My worry is the color. I have seen the diamond and it looks ok, but I haven’t chosen a setting. 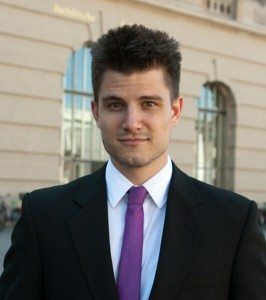 Would you recommend searching for a better color, or better than SI2? I think you meant scintillation or the sparkle/flashes of light when the diamond is viewed in motion. If you didn’t see enough light performance, maybe you can view it in a different light setting or in 20x-40x zoom. It should sparkle nicely since it’s an Ideal cut. And what I meant by body color is the natural color of the diamond. Color grades from K to Z tend to have a faint to light yellow hue. Bigger gems display more color, so it’s advisable to upgrade if you want a colorless looking diamond. I am pricing 2 diamonds for a stud necklace, .75 in size. Both very good cuts. Both s2. One is I color and the other is K color. I honestly can’t see any yellow in the K diamond and will save close to $400 by choosing the K. They both look excellent, almost identical to my untrained eye anyway.. Do you think a K color is acceptable for a stud necklace in white gold? I bought a 3.0 carat I color,SI2 diamond… it is radiant cut, certified by EGL USA lab. I was skeptical about the color but went ahead and had it set in platinum. Well when I picked it up I saw yo much color. I’m so disappointed from everything I read online it seemed to me an I was ok. So now I m in the process of picking a new stone. Any suggestions? First off, never trust grades given by EGL and IGI. Such labs have very low grading criteria in color and clarity that their grades are 2 or even 3 grades higher. I would recommend GIA or AGS grading reports as you can be pretty sure that your diamond will be graded accurately. Also, the color visibility must be because of your 3 carat diamond. Bigger gems tend to show more color, so it’s advisable to opt for higher grades, not lower than H color. If you want to kind of wash the color, you may choose a yellow gold setting, so it can make the diamond appear whiter than it is. And as long as your diamond is eye clean, SI2 is okay. Lastly, if you’re not too stern on the 3 carat mark, you may check out the 2.90-2.99 carat mark. They’re basically the same in size, but the latter is more affordable. With the difference, you can definitely upgrade in color, clarity, and of course, the best cut! Read more about the 3 carats diamond here! Hi sebestian,I am about to take diamond for astrological purpose.Astrologer told me to take 1 carat brilliant cut,K color,clarity Vs1/Vs2. I will put it in a gold ring.Does the specification worthy for my purpose?Please suggest me your views.Thank you in advance. I am about to purchase an engagement ring (setting: solitaire, platinum ; stone: round cut). First of all, I want to point out how helpful your site was! Much obliged. I have a few questions you are most certainly will be able to address: It appears to me, the medium blue fluorescent diamonds in the color grades I-K are slightly more expensive than the equivalent color grades without any fluorescence. 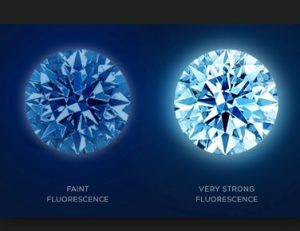 I guess I am wondering whether a K colored diamond with medium florescence would be preferred over a J color graded diamond lacking any fluorescence? Would they appear similar in terms of color? Would a K colored diamond with medium florescence be acceptable for a platinum ring for the inexperienced eye? Thanks for your wonderful feedback! To answer your question: The slight price difference you noticed could be dependent on a few other factors like cut, carat, and clarity. As far as I know, a J colored diamond would still be a better choice especially if your opting for a lighter gem. This is because the diamond color whitening effect of medium fluorescence is only visible in daylight, an environment with UV light, and not in all lighting conditions. Thus, in general, when not subjected to UV light, a non-fluorescence J color diamond will look a little bit brighter than a medium-fluorescence K color diamond. hello i have the option of either 1.5 carat K colour diamond or 2 carat O colour diamond . both have very good cuts and s2 clarity. which one should i go for and what setting should i use ?? yellow gold or white gold?? It’s advisable to see the diamonds before buying, especially in the SI2 range, so you can make sure that it’s eye clean. And for size and color, it actually depends to your liking. Just bear in mind that with bigger diamonds, body color is more evident. If you want to wash out the yellow, then you may opt for the K color and use a yellow gold setting because the gem will appear lighter against a darker backdrop. But if you’re good with yellow and would like to highlight it even more, then you may use white gold. Im interested this one. Can you give me any opinions? I am looking for a light champagne diamond (not brown) but with brown or rosey tones rather than yellow/green tones. Fancy colors are too dark. Which grade is most likely to give me this – I have been looking at O to Z diamonds. yes, if you want to have a champagne diamond, a diamond within the fancy colored range will indeed be too dark for you. Basically, champagne colored diamonds are diamonds with the hue “light brown” or “light pinkish brown”. Quite apparently, you prefer the “light pinkish brown” diamonds. “Light pinkish brown” diamonds are more expensive and even rarer to find than just “light brown” diamonds. 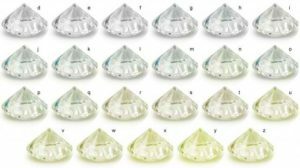 The normal color scale from D-Z does not apply to champagne colored diamonds. On older grading reports you will find information like “w to x range” and on newer grading reports you will only find the information “light brown” or “light pinkish brown”. In the end, you must trust your eyes and decide whether you like the color or not. There is no specific range that will give you the perfect answer because there are different kind of champagne hues. The “light brown” hues that I find to be champagne-like and that are not within the fancy color grading scale are usually within the W to Z range. With your preference for a rosey champagne diamond the range of O to Z will certainly be right. As long as your diamond is “light brown” or “light pinkish brown” your diamond will certainly belong into the champagne category. If you have any more specific questions, you can always drop me a mail! thans for this informative post. Do you think that this would be still okay? yes this is absolutely okay if you wanna make a good deal. A diamond picks up some of the ring setting’ metal color. This effect is the strongest with yellow gold. Thus, it would not make much sense to pick a better color grade for your specific constellation of diamond and ring setting. And don’t worry: The diamond will still appear to be colorless.